While you don't typically think of sweeteners as diet foods, honey might be an exception. Honey has been well-studied for its health benefits, including its antimicrobial properties and its antioxidants, which work to protect your cells from damage and prevent genetic mutations. There's some preliminary evidence that suggests honey might help with weight loss when used in place of table sugar. However, honey is still high in calories and counts as added sugar, so you should eat it in moderation. At 64 calories per tablespoon, honey is moderately high in calories. That's about 5 percent of the calories on a heavily restricted 1,200-calorie weight loss diet and 3 to 4 percent of your daily calorie allowance in a 1,500-calorie diet to 1,800-calorie diet. It's also slightly higher than the calories in sugar, which has 45 calories per tablespoon. While the calories in honey may not seem like much of your daily calorie budget, it can add up quickly if you're eating several servings throughout the day, and, of course, a 1-tablespoon serving isn't likely to fill you up. Make sure you measure your portion size when you're enjoying honey as part of your weight loss diet so you don't accidentally overeat. Honey might offer some weight loss benefits due to its effect on hunger, according to a 2010 study published in the Journal of the American College of Nutrition. The study authors compared the effects of honey and sugar in healthy women, and found that honey had less of an effect on blood sugar than regular table sugar. That's important in controlling your appetite, since rapid swings in your blood sugar levels can trigger hunger, even if you don't truly need more food. However, it's not yet clear exactly how well it works. And because the effects of honey on hunger have not yet been extensively studied, it's too early to count on honey as a magic bullet for reducing your appetite. There's also some early, preliminary evidence directly linking honey to better weight loss if you use it in place of regular sugar. One study, from a 2011 issue of Nutrition Researched, compared the effects of honey and sugar on obesity in rats. The study authors found that rats fed honey ate less during the day than rats fed sugar, and they gained less weight and less body fat than the sugar-fed rats. A small study in people, published in Scientific World Journal in 2008, found that honey triggered a small amount of weight loss -- and fat loss -- compared to table sugar. While these results are promising, they only looked at the benefits of eating honey in place of table sugar. If you're following a low-sugar diet already, honey might not offer any benefits. Even though honey has some weight-loss benefits compared to sugar, you'll still need to practice moderation. Honey still counts as a form of added sugar, and you should limit your intake of added sugar to 9 teaspoons daily for men or 6 teaspoons for women, according to the American Heart Association. If you regularly exceed your daily added sugar limit, you'll increase your risk of heart disease as well as weight gain. If you're currently drinking sugary drinks and eating sugary foods, switching to versions made with honey might help you lose weight. But, more importantly, you should limit your overall sugar intake, either by reducing the amount of sugary foods and beverages you consume, or gradually reducing the sugar used to make them -- to lower your added sugar intake and consume fewer calories. 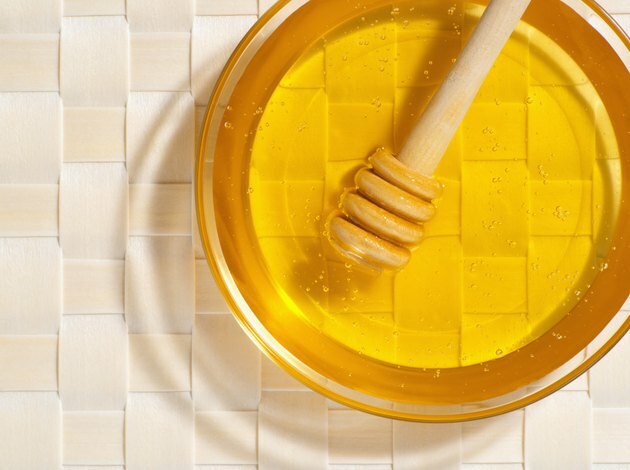 Use honey sparingly in diet-friendly foods, for example, as an addition to a homemade salad dressing, lightly drizzled over oatmeal or used to modestly sweeten tea.